It turns out Justin Bieber’s 21st birthday celebration in Las Vegas this past weekend wasn’t entirely drama free. 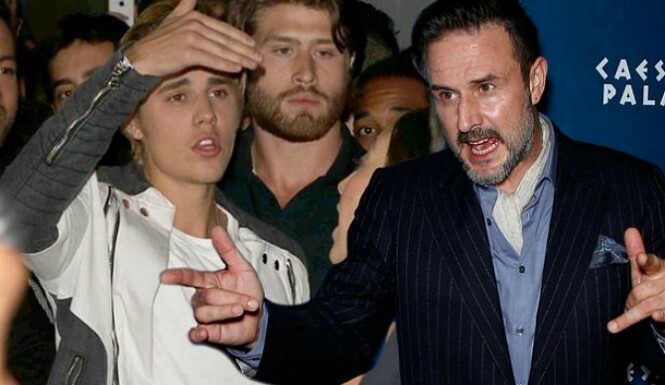 After celebrating at the Omnia Nightclub Saturday night with stars like Kris Jenner and her boyfriend Corey Gamble, Miguel, Katharine McPhee, Ashley Benson and Scooter Braun, Justin continued the party inside his super-expensive suite at Caesars Palace where he eventually booted unwanted party guest, actor David Arquette. But David wasn’t totally unwanted at JB’s celebration. The 43-year-old actor was in attendance earlier in the night because he’s actually an investor in the Heart of Omnia, a smaller, more private club separate from Omnia Nightclub. Justin reportedly hosted his milestone event at the Omnia club inside the famed casino and hotel, for which he was paid a stonking $500,000 by the Hakkasan Group.